Today’s consumers are under extreme pressure to save money and make smarter buying choices, making customer retention and management more important than ever. Focusing on existing customers to drive revenues and profits is much more cost-effective than acquiring new ones. 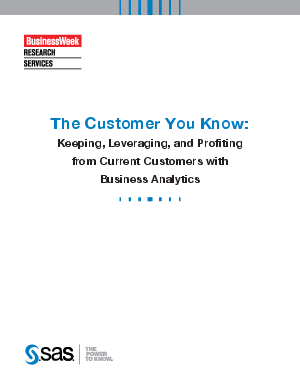 This white paper, prepared by BusinessWeek Research Services for SAS, discusses how business analytics is helping executives understand and utilize data and information to gain greater insight into customer motivations and behaviors, better preparing businesses for the return of the growth economy.